Belize Island Air Transfers "Our Belize Vacation" - "Our Belize Vacation"
Once you arrive at the Belize International Airport, and have had a chance to clear customs with your luggage, you will need to take a 15 passenger aircraft from the Belize mainland to the off-shore island of Ambergris Caye. This is about a 15 minute flight, and is well worth every penny, just for the excitement of seeing the second larges barrier reef in the world, by air. To help alleviate all the many things you have to do prior to leaving your home country, simply email Black Orchid and ask them to make this commuter flight reservation for you. We are here to assist you in any way, and if we can help you get some of the last minute tasks off your "to do list", then let us help. APPROXIMATE COST: Expect to pay about $125.00 USD for a round trip fare from Belize International Airport to San Pedro and back. When making your reservation, simply select "yes" when it asks for assistance in making this island air transfer reservation. PASSENGERS PLEASE BE ADVISED: Passengers are asked that the following items should not be placed in their check-in luggage. Cameras, cell phones, jewelry, money, receipts, medicine, eyeglasses, legal documents, antiques, computers, anything fragile, perishable or valuable. Island transportation services will not be liable for any damage or loss of any of these items. ISLAND AIR TRANSFERS - WHERE THEY FLY! BELIZE CITY - Belize City is the hub of transportation, commerce and culture. The Museum of Belize, The Bliss Institute and The House of Culture (housed in a 19th century building that was once the residence of colonial Governors) all showcase stunning ancient artifacts and historical memorabilia. You can watch sailboats rock gently near the hand cranked swing Bridge, or on the outskirts of Belize City see tableaus of Maya sites, rainforest, waterfalls, caves and industry at Old Belize. For a short excursion, get close to jaguars and other native species at the Belize Zoo, indulge in an air boat ride through Manatee Lagoon or climb a 60 ft. Maya ruin (Altun Ha). Offshore take a boat to St. George's or Goff's Caye for snorkeling and manatee spotting. CAYE CAULKER - Situate 21 miles northeast of Belize City, and 11 miles south of Ambergris Caye, Caye Caulker is the epitome of a laid back lifestyle. June is famous for Lobsterfeast which celebrates the opening of the lobster season. Front Street is full of brightly colored wooden houses, shops, restaurants and small hotels. The Barrier Reef is clearly visible from shore and a snorkeling visit to Shark Ray Alley is highly recommended. PLACENCIA - The 16 mile long Placencia peninsula in southern Belize is home to three communities; Maya Beach, Seine Bight and Placencia Village. The village itself is home to the narrowest main street in the world, according to Guiness World Book of Records. Here too, Lobsterfeast is a popular celebration in June. In February, the Placencia Sidewalk Arts Festival takes place. April and May see the arrival of the magnificent whale shark and diving or snorkeling with them is a not-to-be missed experience. From here, you can also explore Monkey River and the Cockscomb Basin or sail to many of the southern cayes. Laughing Bird Caye National Park just a short boat ride away. DANGRIGA (HOPKINS) - Home to the Garifuna, a unique cultural and ethnic group, Dangriga is famous for its drums and punta music. 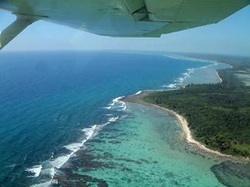 South Water Caye, Tobacco Caye and Glover's Reef atoll are a short boat ride from here. Hopkins, a 40 minute drive from Dangriga, is a quaint, quiet fishing village. The surrounding marsh landscape is home to jabiru storks and other interesting birds. Stretching across nearly 5 miles of sand palm strewn beach, Hopkins is home to thousands of Garifuna families and lately has become the home of many new resorts that combine the best of the Maya Mountains, the beach, the reef and the rich and diverse culture unique to this area. COROZAL - The town of Corozal occupies the foundations of the ancient Maya city of Santa Rita, the remains of which can still be visited on the hill overlooking town. Another Maya site, Cerros, overlooks the white capped bay. Corozal was traditionally the heart of the country's sugar industry, and sugar cane fields are still abundant in the surrounding countryside. Home of the Free Zone, and near to the Mexican border, Corozal is the getaway to Mexico's Riviera Maya. Not far from Corozal are the picturesque fishing village of Sarteneja and the Shipstern Nature Reserve with its abundant flora and fauna. FLORES (TIKAL) - Florez, Guatemala is home to the grand Maya site of Tikal. Deep in the Peten jungle of Guatemala, it ranks among the most significant archaeological discoveries of the region. Three thousand stone temples, palaces, and other structures date back thousand of years. Tikal is a place for marveling at the amazing accomplishments of the Maya civilization and the splendors of the surrounding jungle. The area also presents an excellent opportunity to see toucans, spider and howler monkeys among others. SAN PEDRO - San Pedro is the main town on Ambergris Caye, the most northerly and largest of the 200 cayes off the coast of Belize. It is a world-class diving and snorkeling destination, with dive sites on the barrier reef, just a 20 minute boat ride away. Hol Chan Marine Reserve is abundant with fish and a snorkeler's dream. The clear, shallow waters and prevailing winds are ideal for windsurfing, sailing, and kite surfing. North of the island, the Bacalar Chico Reserve is an adventure's paradise. The lagoon on the leeward side provides an excellent opportunity for kayaking and birding. San Pedro town has a unique feel and offers sophisticated international cuisine in beach side restaurants, mixed with local cafes serving traditional Belizean food. The street bustle with local artists and craftmen displaying their wares. PUNTA GORDA - PG as it is locally known, is the largest town in the fishing and agricultural area of the Toledo district. The surrounding areas are full of traditional Mayan villages. Visitors can interact with Maya Indians, spend the night in traditional houses and eat tasty "caldo" and corn tortillas. PG is the gateway to Guatemala with daily boats to Puerto Barrios. The public dock off Front Street., marks the center of town with customs and immigration located here. Visit Toledo in May and experience Chocolate and Wine at The Cacao Festival. For the adventurous, some of the largest cave systems in the world can be found nearby. On Wednesday and Saturday, the market on front street showcases produce from local farmers and hand craft items from Mayan artists. BELMOPAN - Referred to as "Garden City", Belmopan was established as Belize's capital after Hurricane Hattie in 1961. Here you will find the seat of government and its agencies along with foreign embassies. Belmopan is also the destination to fly to if you're looking for inland adventure and natural beauty of the Cayo district. The Mountain Pine Ridge is one of the highlights as you travel from jungle into a pine forest. Here you will find Thousand Food Falls, Rio on Caves, Rio Frio Pools, and beautiful caves and rivers. Cayo is also home to some of the most famous Maya sites (Xunantunich, Cahal Pech and Caracol). Don't forget the Ruta Maya River Canoe Challenge every March, the inaldn Blue Hole, horseback riding, cave canoeing, hiking, cave tubing, zip-lining and birding.